Children will find out what it really means to give their heart to Jesus. A little girl sees her mama change every day in this fun and warmhearted story. - Publisher When Mother says "I gave my heart to Jesus," her little girl with long, flower-bedecked braids wonders why she still hears it beating when they hug! Eventually Mama explains about entrusting your feelings, thoughts, plans, and dreams to Jesus. A marvelously age-appropriate explanation of faith and transformed life for your 4- to 6-year-olds. 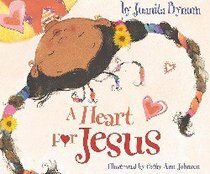 About "A Heart For Jesus"
When Mother says "I gave my heart to Jesus," her little girl with long, flower-bedecked braids wonders why she still hears it beating when they hug! Eventually Mama explains about entrusting your feelings, thoughts, plans, and dreams to Jesus. A marvelously age-appropriate explanation of faith and transformed life for your 4- to 6-year-olds. Juanita Bynum's powerful gospel ministry in word and song has encouraged and transformed millions of hearts worldwide, as has many of her books. She hosts television programs and often shares her insights in women's ministries. In addition, she has authored bestselling titles such as No More Sheets, Matters of the Heart, The Threshing Floor, and A Heart for Jesus. Johnson received her BFA from Columbus College of Art and Design in Columbus.